It is easy to continually look and learn from other artists in today’s intellectual context. I thought it might be nice to go see some art today, taking advantage of the time and many available museums in the area. I began my search online, only to get stuck in multiple excellent online exhibits that let me study images (on a big pretty screen, now!) without having to stand up or walk around until my legs feel like falling off. I love seeing original artworks and know there is magic lost by viewing the flat, almost glossy digital images, but it is an amazing thing to be able to just sit in one’s kitchen with a cup of espresso (and eight animals waiting patiently for breakfast) and see such incredibly unusual exhibits. This morning I came across this gem featuring photographs taken by Lyonel Feininger. I have long appreciated his paintings, drawings, and prints, and seeing this collection was a whole new artistic event! 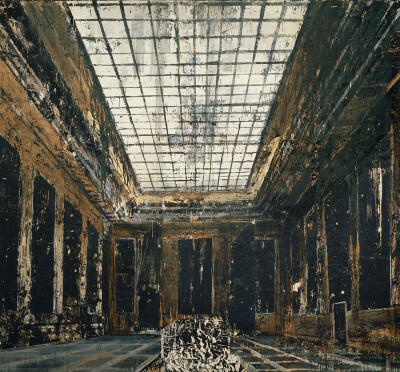 The dark, scratchy feel of the photos reminds me of Kiefer (not a bad thing at all.) I also love the photos of what are called "toys" -- little crude, wooden, cubist scultpure-thingys that look like the figures in Feininger's paintings. I've been thinking of doing a series of pieces based on my little cloth dolls...interesting connection. While I’d love to go see the collection in person at the Harvard University Art Museums, I can look very carefully at them here, and would argue for a little longer with return visits as needed, via the internet. Is the museum itself a dying animal? In the future, will artwork be digitized, posted, and then filed away for preservation without needing a real audience? I am not sure that could happen to all art, but for more obscure collections, it is a possibility. Most definitely not for textiles as seeing the fiber in person unleashes a direct connection to the hands of the maker, and that is a lovely detail that digital resources can not transmit. And now, back to important things. The bunny nest has been evacuated and is a bare, ugly hole in the ground, just waiting for me to twist an ankle in when I finally pluck up enough courage to mow the obnoxiously long lawn. On the bright side, I saw two little white puffs leap to the longer weedy patches this morning when I opened the back door, so feel like there is a thriving community happening in the overgrowth. Catching sight of these little sprites is a challenge but when it happens, I still find myself emitting a squee and pointing out the bunnies to whatever dog is at my ankle. Sometimes there isn’t a dog at my ankle and I pretend. They are so dang adorable and I am not tired of them yet. I wish I could help them overwinter in some way so that they are here again in the spring. Most likely no museum today, and most likely will try to finish up the necessary chores so that I can claim a good sized block of art time with which to complete the small series of bowl pieces. Getting ready for next week’s kids’ art class and am so looking forward to “playing with art” again! At least I can virtually travel without taking too much time and energy away from the important things I have to do. Ah, the struggle is real. Loving this summer. Lots going on, artistically and otherwise! Bunnies, Toby, beads, and more. Oh my. First, the inevitable has happened. This morning the Tobster took a bad fall down the big flight of stairs. I was encouraging him to take the first step by touching his collar, and before I could grip it he went for it, but missed the rhythm, and did an ungraceful waterslide-like maneuver down the entire flight. He was shaken, and gimpy for only a few minutes. I picked him up and snuggled him as I carried him to his kitchen bed (if you know Tobes, that isn't an easy task.) He got up and walked around, went out, and seems okay. Still, I'm sickened at the thought of what could happen. Might have to put gates at the stairs now, too. I am dedicated to giving this dog a "good finish" to life even though he's been a royal piece of trouble for a decade. He's been a dedicated to me unlike the other dogs, and needs me now more than he ever has. That's what having a dog is all about. When you take that puppy (or kitten, or bird) home, it's a promise. The bunnies are still evident, but a little less visible. Except for last night when two little ones, about 6 weeks old or so, scampered across my back yard holding long grasses in their mouths. Tandem dancers. Precious exceptional bright white puffs on their bums. I tried to tell them that they should and could stay and finish their dinner, but they were off. Saturday night a friend brought over a very young orphaned bun (long story, but a legit orphan) and we tried to add it to the nest I have in my yard. It didn't nurse overnight, and she came and got it the next morning. Sadly, the tiny little fella or gal wasn't going to make it, so my friend took it home to be buried with it's siblings. By contrast, as we fished the little one out of the nest, I could check on the other buns and saw that they are plump, warm, and beautiful in their shallow earth bassinet. I will not say whether I snuck kisses onto one of the buns heads and little round bellies. It might have happened. It might not have. Can't. help. the. cuteness. Beads. Oh, beads. I do not know what makes them so wonderful to me. As many as I have, and my GOD I have many, there are always new ones to find, or ones I know I just used up to replace. Joann's had a 70% off sale, including clearance. Strands for under a dollar. Really? Ones I use, too! Sigh. The temptation never ends. But, I do use them, and the more organized I get around here, the more likely I will use them more. Over the past couple years my art spaces have turned jungle-like in their disorganization. I work with so many different techniques, and they overlap, so stuff just gets everywhere. Paints, papers, glues, drawing materials, fabrics (and stabilizers and batting), threads, yarns, beads, printing materials, fabric dyeing materials, and more have been happily breeding and getting nasty in my several dedicated art rooms. Add cats and their unique perspective on helping me organize, and it can get chaotic pretty quickly. I am blessed to have such space and pray that my deceased parents aren't so horrified that they are cursing me on what their house has become! This summer has brought more energy to the scene, and bit by bit, it is getting better. I've established war zones for each material, and am getting through the messes as they are discovered. But, the process never seems to end, and one could just organize all day without actually making anything. That doesn't feel right in my heart of hearts, so finding balance is key. Yesterday I moved my old computer into the my main art room and it feels like a shrine to Amanda Palmer in one corner. Viva Art! And summer vacation is just/only/already half way over. Will be going into the classroom soon. My classroom floor is done and is beautiful! I remember growing up in Reading and having little to do in the summer. Being a creative kid I lived at the library and borrowed every stitching book they had, and learned so much. I kept busy, but really didn’t have much to do. I am so happy that parents on Facebook responded positively to having a pop up kids art class this summer and within a couple days it filled up! Yay! I miss the fun of kids making art and seeing their creativity and skill in action. A week long sketchbook class starts 7/31 and should be really fun! Thank you to all parents (and Grandparents, Pam!) who signed up their kids for what I hope will be a launchpad for personal creative time for the remainder of the summer. Maybe next year I’ll try this again...and add a second week dedicated to fiber art? Hmmm. I love teaching and miss it over the summer! Okay, today’s ramblings are over, my first two espressos are done. It is an overcast, cool morning, perfect for boring jobs like filing and laundry. Better get a move on or it will be 11 am before I know it. Cheers. I am thinking about my current fascination with wild rabbits. Reading is lately overrun with baby bunnies. And the grown up ones. The sight of the adult ones is reducing me to the silly state of a child at the zoo. The sight of the babies puts me in a state where I point and say, to no one in particular, “Look! A Baybeeeeeeee bunny!” as if they were a rare species newly found in my backyard by a screaming two year old. No wonder they scoot away so quickly. I am in love with these breathing, jumping, munching, scampering, playing little live yard sculptures...and am trying to understand why. Ok, admittedly I am an animal person. This means I find myself much more comfortable in a room full of critters than many people (kids excluded, they are kind of like the animals, and not in a bad way!) So that is one reason for my attraction to my little brown yard buddies. The wild rabbits are just that -- wild -- in no way, shape or form will they be put on a lap and cuddled, given a name like “Sprinkles” and forced to live in a domestic harem of a cage filled with a bag of Hartz hay and stale pellets. They are free and wild. And they actually are happy and comfortable living among us humans. They don’t even move when we see them (except for the itty bitty new bunny near my front fence - I call him Pippy, ok, naming rule broken.) They keep a wary eye on us, but it is as if they can nod and say ”It’s cool, man” and keep on munching. A mutual trust, of sorts. Finding a baby nest (den?) was the highlight for me of this past spring. Watching the squirming little bald newborns turn into vibrant and beautiful rabbits was akin to experiencing a miracle. The miracle of nature. Here you have a simple-minded creature, a rabbit. It gets pregnant and instinctively knows to go find a good spot in the open to dig a deep hole to give birth. Out in the open to deter predators. Did it read a book on that or something? It sneaks over to the hole, pretends to munch grass and BAM delivers a load of baby bunnies. Then covers them up and leaves. Alone they snuggle, in a dark, damp, fur-lined hole, waiting for their once-a-day visit from Mama, who again parks over the hole and pretends to feed while each baby takes a day’s worth of sustenance. A baby bunny can ingest a day’s worth of calories in minutes, only once a day. I wish feeding humans, myself especially, was that easy. When I naughtily checked the hole by moving the fur and grass cover, I was greeted with an immediate response from the squirming little ones, their tiny pink noses reaching out ahead of closed eyes looking for their meal. So cute. I quickly cover up the hole, pat down the grasses, and sneak away, hoping the foxes under my barn aren’t watching. Within days, it seems, the buns develop fur and their eyes are open, but their little ears lie flat against their bodies, a sign that they are still too immature to be on their own. Secretly Mama keeps returning to feed them, sight unseen by human eyes most of the time, and they grow. In their mysterious underground cavern. All that growing takes a lot of sleep, I guess. The urge to scoop up each little warm ball of fur is almost unbearable, but I know it is forbidden in this delicate agreement between me and the mama bunny. All this goes on in my plain, un-manicured yard. It appears as if nothing is happening. All quiet on the surface. Just the natural rhythm of day to day natural things. But this time, this season, when the rabbits are plentiful enough to camp out and have their families grow in our suburban presence, we can observe. Bunnies aren’t rocket scientists. Having had one as a pet years ago, I can attest to their rather reserved intellectual skills. Yet they got this reproduction thing down pat, instinctively. I seriously doubt a mama rabbit stays up late wondering about the world and her role in it. About what her babies will do when they grow up, and how she will find enough grass the next day to allow her to feed her young. Nope, she just does like a bunny and does it, minute by minute, hour by hour. I read that wild bunnies only live a couple or few years. Maybe that is why they don't care so much. As someone who has a habit of overthinking, often with a high degree of frustration over what my body can’t do even though my mind wants it done, this is a refreshing attitude. I wonder if rabbits have a list of daily “shoulds” in their little rabbit minds? I doubt it. I bet a rabbit’s inner dialogue is something like “munch...munch...that was a good piece of grass...munch.” I can learn a lot from my bunnies. Maybe floating through every day like a rabbit isn’t such a bad way to go. Permission to be an Artist, with a Capital A. Granted, Ma’am. Why is it sometimes so hard to give ourselves “permission” to do what we need to do to be happy? I ask this because with so much free time comes more reflection, and I am noticing how many times a day the “shoulds” and “shouldn’ts” pop up. I shouldn’t spend this much time on the computer. I should be pulling weeds or doing laundry or sorting that pile of accrued junk that has been there since last October. I should eat better, and move more, even though it hurts to do so. I should be cleaning my cellar, painting the side of my house, washing the dogs, playing games with the birds. I should be scrubbing the radiators (regular readers know why, lol), washing the floors, painting the walls. I should be organizing my artwork, getting rid of clutter, cleaning my fridge, and cleaning under my bed. I should be making those onerous phone calls concerning tangled up insurance and bill stuff. I should be finding the floors of lost closets and FINALLY paring down my strange wardrobe to essentials. I should, should, should. Or, I can forget all that, sit down, and just stitch and bead for a few hours. And feel like I’ve really accomplished something. I could, but so often I don’t, because I feel the pull of all the other things that need doing. That “should” be done, before I “indulge” in recreational activity such as artmaking. But what if it isn’t just recreation, but creation, and it is essential to my well being? I’ve come to realize that the positive benefits of working on my art are important to my sense of wellness. I can truly escape pain by getting engaged in the rhythm, of the stitch. The arthritis is now in the soft tissues of my elbows, adding to the aggravation of constantly painful feet and legs. It never ends. Rome might be burning, but that texture that happens when that viscose thread overlays the area of patchy lamé and digitally printed cloth is just perfect! I feel fellow artists can relate. So, with more time to actually do art, my Responsible brain seeks universal permission to indulge. To stay up late and work until I just can’t any more, knowing I can sleep in as needed. To delay required tasks and just go with it, and see what happens. To give myself permission to “go deep” with the art and see if there are any new things to discover. There usually are. As a teacher who works on a ten month contract and “has summers off” I do suffer from a fair amount of “survivor’s guilt” for having time off to have such a problem on my hands. I would argue that I work more than the average 40 hour a week employee -- year round -- in my head, at least. I am always thinking of ways to teach better and to “art” better, and rarely take a “real” vacation. I can’t think of the last time I went away somewhere and just rested or chilled out. Just not my way, and certainly not within my finances. My idea of the best way to use extra time is to go fishing into my art, seeing what I can catch. I am working on the first of several bowl images, and am finding as I embellish and make a juicy, reflective surface, the lively digital image is somewhat lost. I think of Picasso, a quote that stated something to the effect of “You have to ruin a picture in order to finish it,” and also “All art is first a form of destruction.” I am glad that I have a series of many bowls to create this summer and see how each one develops and resolves. Knowing that each is begun with a digital, reproducible process is reassuring and lets me take the plunge to push a piece...I can always leave another less embellished, later. Summer marches on! July 6th already? Wow! Three previous attempts at posting lately ended up in frustration as the Weebly ghost ate the post when I tried to publish. Grrr. Back to writing in Google first and pasting it into the Weebly browser. Thank heavens for Google Docs! Big art room changes. The summer of studio shock and awe, really. What was a chaotic mess of fabric piles, cat hair, a few unmentionables, paper scraps, and buried sewing machines has been restored. My little sewing room was updated with a beautiful rolling chalk board / bulletin board salvaged from the trash, and it has inspired a major clean out and reorg of the space that had become completely uninspiring and almost uninhabitable (unless you are a cat, in which case the places to sleep and shed were innumerable, so it was heaven.) I always think of this space as a good sized room, because it served as my parents' bedroom growing up, but it is really a small space. Maybe 12x8, not counting the path needed to walk through to get to the upstairs of my house. It is bright and sunny, right on the street, with uncovered windows unlike when my parents used it, and feels like a good space when it is cleaned up. ​Now every piece of fabric has been folded, sorted, and revived. And oh-my-God is there fabric. Many piecves of cotton have been washed to remove the felted fur layer that Theo has built up by sneakily sleeping in the fabric drawers. All the silky, snake like pieces of dress fabric have been bagged in uniform little sandwich zippies and are (almost) stored so they won’t escape. Most important, all my favorite and beautiful silk lame from Borovick’s Fabrics in London (the only place I’ve ever been able to find the stuff) is organized -- and it’s reassuring to know there is a healthy supply of it ready to go in numerous shades. I’ve dumped things, moved shelves and furniture around, and have added a special feature to the room. Last year I fell in love with a rocking chair at Pier One. Being hesitant to add anything of value to the decor due to the dogs and birds, I waited. I buckled this spring and charged it (lol - oops!) and it now sits in my art room, in the fabric corner. With a wonderful kilim covered footstool that my incredibly generous neighbors gave me. There are rugs to match, but thanks to Toby, no. So, if I behave myself and stay organized, I have a place to park my behind comfortably and read, hand stitch, draw, or think. For a small space, it now can handle a lot of doing! All because of a piece of Parker nostalgia that I couldn’t bear to see stay in the dumpster. Feels really motivating, and as soon as I can straighten out all the other rooms that have incurred fallout from the restructuring of this one, I’ll be creating with enthusiasm. One problem I have is scrap bags. There are so many. They accumulate and sit in plastic bags like jewels, combining serendipitously and creating inspiring bundles of texture, color, and pattern. I’ve tried every way to save and store these little guys over the past umpteen years with limited success. It’s handy to have a bag of stuff ready to go for classes and workshops, but it seems like these things breed like bunnies and the bags turn up all over the art room. I’ve tried sorting by color, or just keeping random bags around. Since I am on a plastic baggie kick, I am trying something new. Instead of leaving all the scraps in bigger bags, I am going through them and making little grab bags of interesting pieces that feel good together. When the bag is full, I close it and it is now a grab bag for times when I don’t know what to sew, and need a challenge. I love to make little mummy dolls, so maybe they will become these. Or small collages. Or. Or. Or, The quantity is manageable and the variety in each bag is visually exciting. Will give it a try, and hope it works to contain the creative craziness! Vacation is going well, I am trying to work hard and push myself to get the most out of each long day. It is easier to respond to the demands of RA when I am not working and I do get more done, yet trying to accept the delays and downtime is still challenging. One of the pain meds I’ve been asked to take is suddenly unavailable, and I think my body is adjusting to the change. Push, push, push. Time is so precious. Cheers.